URBANA - Woodland owners in Illinois may be surprised to learn that timber produced on their land is part of a $23 billion industry in Illinois and is a major contributor to the state’s economy, according to Jay Hayek, extension forestry specialist at the University of Illinois. Based on a report of 2010 economic data, the $23 billion breaks down like this: Total Illinois forest products and forestry-related employment included 131,549 full- or part-time jobs with an annual payroll of $8.10 billion. Local, state, and federal government also benefited with more than $871 million paid to state and local governments and $1.6 billion paid to the federal government, all in the form of taxes. The total value added, which was available for wages, profits and taxes, amounted to over $11.4 billion. The economic impacts of the forest products industry in Illinois were determined from 2010 data examined by forest economists Ian Munn and James Henderson of Mississippi State University College of Forest Resources. Using input-output analysis, Henderson and Munn determined direct employment, wages, production, and value added from manufacturing; indirect effects from industry purchases of goods and services; and the induced effect of purchases of consumer goods and services by employees of forest products and supporting industries. Results showed the significance of the industries based on renewable and readily available wood resources in Illinois. 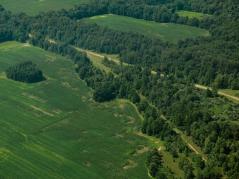 Timberland in Illinois accounts for 13.4 percent of the state’s total land area and covers over 4.78 million acres. Illinois landowners sold $16.66 million worth of timber from their woodlands in 2010, providing the raw materials necessary for wood products such as hardwood lumber, veneer, crossties, mine timbers, pallets, pulp, and many other uses. Munn and Henderson explained that there are six sectors in the forest products industry: timber production and logging, solid wood products, pulp and paper, furniture, urban forestry, and miscellaneous forest products. “The logging sector harvests the timber and delivers it to mills to create wood products such as lumber, plywood, fence posts, and wood chips,” Gunter said. “In 2010, over 1,190 direct, indirect, and induced jobs were related to timber harvesting with wages totaling $45.35 million. Their contribution to the total economy was an estimated $122.1 million in industrial output and $61.68 million in value added,” he said. Solid wood products are made at sawmills, plywood mills, veneer mills, reconstituted wood product mills, and other wood-manufacturing facilities. This sector and supporting industries generated 18,316 jobs in 2010 and paid out $917 million in wages. The value of the industrial output from these facilities totaled $2.59 billion. The total value added exceeded $1.37 billion. The pulp and paper sector includes pulp mills, paper mills, paperboard mills, and manufacturers of paperboard containers and boxes, converted paper and paperboard products, and other related paper products. “Pulp and paper was the largest forest products contributor to the Illinois economy,” Munn said. This sector generated over 90,000 jobs from direct employment and indirect and induced impacts. Total wages exceeded $5.38 billion. Total industrial output was $17.6 billion, with more than $8.35 billion of value added by manufacturing, according to the report. Production of wood furniture includes such products as upholstered furniture, office furniture, household furniture, and wood partitions and fixtures. In 2010, direct, indirect, and induced employment in wood furniture production totaled 20,267 jobs. Total wages were $1.05 billion. Industry output amounted to $2.83 billion, with an associated $1.58 billion in value added. Munn said that urban forestry firms provide such functions as city tree management, tree pruning, removal, arboriculture and related services. Direct, indirect and induced employment for urban forestry in 2010 totaled 5,214 jobs. Total wages were $208.96 million. Total industry output was $521.53 million, with value-added impacts of $316.87 million. Miscellaneous forest products services, such as tree nurseries, consulting foresters, and other support activities, are critical to the other forest product sectors, Munn said. “This smallest forest-product sector and its associated activities accounted for 965 jobs in total,” he said. Total wages paid were $38.49 million. Total industry output for miscellaneous forest products was estimated at $110.9 million. Value added by these services exceeded $63.6 million. According to Hayek, two additional facts immediately stood out from this study. First, Illinois woodland owners are grossly underselling their standing timber investment to loggers and timber buyers. “Illinois woodland owners have sold nearly $225 million worth of standing timber since FY2003, or nearly $22.5 million annually,” he said. This number, explains Hayek, should be much, much higher. Unfortunately, over 90 percent of Illinois woodland owners fail to secure the professional services of a trained college forester to assist them in the marketing and administration of their timber sales. “Woodland owners who involve the services of an independent professional forester frequently earn 25 to 220 percent more revenue and frequently leave more high-quality trees for future timber sales when they work with a professional forester throughout the timber sale process,” Hayek said. Second, Hayek pointed out that state Division of Forest Resources and U of I Extension forestry staffing levels need to be reevaluated immediately in order to grow these forestry-based economic impact numbers even higher. “It scares me to think just how big this number could have been had adequate professional forestry staffing levels been achieved based on repeated recommendations from the governor’s Illinois Forestry Development Council. For example, the state of Illinois has been without a forest products specialist for over 13 years,” Hayek said. Over the years, Hayek has spoken with multiple representatives from Illinois’s logging and sawmilling industry. One of the biggest complaints Hayek hears about from those who make their livelihood in the forest products industry is just how unfriendly Illinois is to small business owners in terms of taxes and the outrageously high cost of workers compensation insurance here in the state. According to Hayek, those two factors combined are why many loggers and sawmills have left Illinois for ‘greener forests’ in Missouri and Indiana. “Sadly, Illinois has lost nearly 225 primary wood-using sawmills since 1961,” Hayek said. “Today there are fewer than 85 production sawmills left in a state with nearly 5 million acres of forest land,” he said. The complete report, which was commissioned by the Illinois Forestry Development Council, is available online at ifdc.nres.uiuc.edu/.